Can you use puzzles in the classroom? Absolutely! In fact, they support brain health while providing support to learning new concepts and vocabulary. 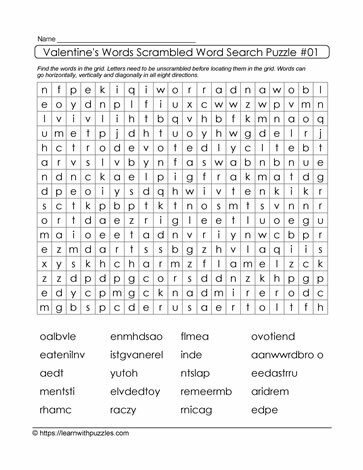 This Valentine's Day scrambled letters word search puzzle is a perfect example of activating problem solving strategies as students work to unjumble the letters in the list of words. To solve the puzzle, students need to unscramble words before finding them in the grid. Remember that some clues include 2 or 3 words AND the clues are not indicative of the number of letters in each word. For example: the two word clue in this puzzle has more than one letter in each word.